Empower Your Immune System with APCO Plant-Based Health Products. In today’s world, our immune system is constantly being challenged. It’s no longer enough to just eat healthily and exercise. Learn how APCO plant-based health products can offer unique and effective immune system support. APCO Plant-based health products give your immune system the ability to Strengthen, Boost, Balance, Recognize, Respond, Remember, Educated and Empower Your Immune system again potential health threats. and 5 Plant-based Non-Toxic Ingredients. During the last decades, development of specific agents affecting T helper cell subpopulations, i.e., Th1, Th2 and Th17, differentiation has drawn special attention. Many natural products were reported as a good agent for modulating the immune response by regulating the differentiation of T helper cell subpopulations. These products are potential to be the immunostimulants for treatment of various diseases including infectious diseases, cancers, autoimmune diseases and also diabetes. In this study, we aim to study the immunomodulatory effects of the Operation BIM product. We investigate the possible effect of the Operation BIM product on the controlling of T helper cell subpopulation differentiation. The objective of this study is to investigate the possible effects of the Operation BIM product on the regulation of T helper cell subpopulations. The levels of various cytokines of blood collected from healthy donors before and after taking Operation BIM product for 15 days were compared. Blood (5 ml. using heparin as anticoagulant) were collected from each subject at day 0. 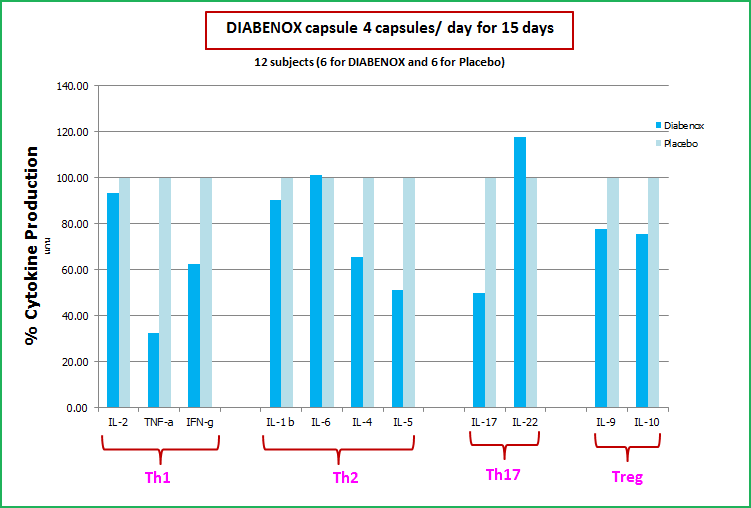 According to their group, subjects took Operation BIM product or placebo (4 capsules/day) every day for 15 days. Afterward, blood was collected (5 ml. using heparin as anticoagulant) for the second time at day 16. Peripheral blood mononuclear cells (PBMCs) were isolated from the collected blood by using Ficoll-Hypaque gradient centrifugation. PBMCs were in vitro stimulated with or without anti-CD3 monoclonal antibodies (clones OKT3) and cultured for 24 hours at 37oC in a CO2 incubator. The cell culture supernatant was collected and centrifuged 20,000 rpm, 2 min. The cell-free supernatants were separated and stored at -70°C for determination of cytokines. Cytokines in the cell culture supernatant were determined by Flow cytomixÒ (eBioscience, Inc. San Diego, CA, USA) followed the manufacturer’s protocol. Comparison of the cytokine levels from un-stimulated PBMC and stimulated PBMC in term of Stimulation Index on day 0 and day 15 were performed. The stimulation indexes of various cytokines in subjects taking the BIM product and placebo were calculated and compared. By normalization using subjects taking placebo, % enhancement and reduction of subjects taking BIM product were shown in Figure below. The results indicate that Operation BIM product reduced the production of TNF-a, IFN-g, IL-4, IL-5, IL-9, IL-10, IL-12, and IL-17. A decrease of TNF-α, IL-6, and IL-17 lower the severity of inflammation. The remedy for arthritis, SLE, atopic dermatitis. The decrease of TNF-α and INF-ɣ lower attack on pancreas β-cell, more insulin is secreted, the blood sugar level is lowered, diabetes type-I is improved. Insulin-resistant is also decreased, blood sugar level is lowered, diabetes type-II is improved. A decrease of IL-17 lowers the severity of autoimmunity and diabetes.